Online registration for this event is closed. Race day registration will be available starting at 9:00 AM at TEMS - 201 S. 4 Street. FREE Cancer Survivor Registration - Cancer Survivors are invited to participate in the run, bike and or walk at no cost! Complimentary Tshirts included! Register by March 3rd for your free T-shirt! Register team/family members in one transaction. Proceeds will benefit the TEAR Fund, Trinity Emergency Assistance Relief Fund, The fund is used to support those cancer patients and their families with everyday needs; prescription medication, gas cards, utility bills, wigs, etc. Each patient can receive up to $1,000.00 based on their needs. ? Join with others in the Seventh Annual Campbell-Dickinson Bike Run Walk against cancer. The event is on Saturday, March 16, 2019 in Toronto, Ohio. ?You are asked to form a team or join an existing team. High School teams are welcome! FREE t-shirt if registered before March 3rd. Avoid the rush T-shirts can be picked up on Friday, March 15, 2019 at the TEMS Building at 201 S. Fourth Street, Toronto, OH from 6:00 PM to 9:00 PM. Race day registration and sign in starts at 8:00 AM on March 16. THE FUN RUN BIKE WALK IS A SPONSORED EVENT MEANING RUNNERS, WALKERS AND KIDS ARE ENCOURAGED TO SIGN UP FAMILY, FRIENDS, NEIGHBORS, CO-WORKERS, ETC. AS SPONSORS TO ASSIST IN THE RAISING OF FUNDS. Each year, 160,000 children are diagnosed with cancer worldwide. Cancer is the number one disease killer of children in the U.S. and Canada. Research saves lives. 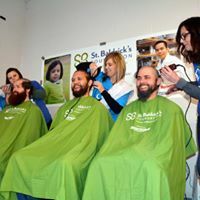 The St. Baldrick's Foundation is a volunteer - driven charity committed to funding the most promising research to find cures for childhood cancer and give survivors long and healthy lives For information call Matt Lewis at 740-632-4064 and visit StBaldricks.org. The events listed are not affiliated with the school district. However, permission has been granted for distribution. Dogs are prohibited from any and all events of the Campbell-Dickinson and the St Baldrick's Shave Off. Furthermore dogs are not allowed on Henry Street, the event area, between S. Third Street and S. Fourth Street due to the lack of insurance coverage and as recommended by the Toronto City Police Department. Call 740-317-3947 and/or visit www.TheGemCity.org click on Campbell-Dickinson. When this page loaded, the official time was 8:39:07 AM EDT.